Wood has been a popular material to carve from for a very long time, and you may be amazed at some of the carvings that people have done over time. 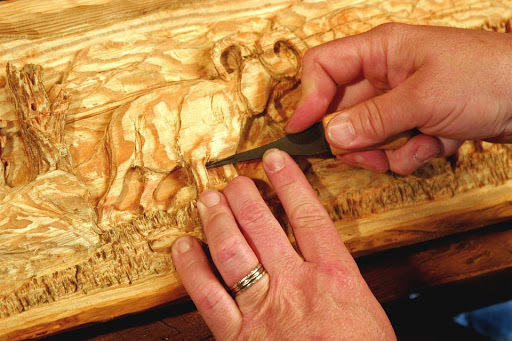 With just a quick search online, you can see some excellent examples of some of the different types of wood carving. Many of the shapes and the designs have names, and below you will see a summary of some of the different types of wooden carvings that have been prevalent over the years. For as long as people have been making furniture from wood, we have also added intricacies to the design through the addition of carving. During the 18th century, the practice became more of an art form with elaborate decorations being added to furniture to enhance the pieces. Many items of antique furniture from this period will have beautifully carved decorations such as the animal heads and claws, scallop shells, or ruffle carvings. Ruffle Carving – This is where the wood is crafted to look like a gathered cloth, or a type of material. Gadrooning – With this type of carving a series of twisted carvings are created around the edge of a piece of furniture. It can also be known as piecrust carving and appears to have scalloped edges going around the edge which is like how a pie looks. Carved Moulding – The furniture maker will add strips of carved wood to an item of furniture which is used as trim to decorate and finish off the piece. Patera – This is either round or oval. This often includes a motif and will sometimes have radiating design from the centre different segments. Lion Mask – A popular design for many centuries is the carved lion head, which can often be seen adorning many different types of furniture. Lions were often carved for nobility when they were commissioning furniture to be created for them. The Rams Head – Another popular animal motif is the rams head, which can also be seen on many different types of furniture in a variety of different designs. Rossette – This is often included in wooden carvings. Rossettes are the shape of rose petals. Knuckle Arm – A popular design for the arms of chairs, the knuckle arm is found at the end of the chair arm and can also be known as Scrolled Knuckle Arms. Linenfold Carving – With this type of carving it looks just as the name suggest, folded linen. Craftsman would incorporate this design into many different types of furniture and is something commonly seen in antiques. Cabochon – This is a carved motif which usually consists of a ball shape and you will usually find that it is also surrounded by leaf ornaments. Cartouche – This is often a phrase that you will hear when talking about ancient Egypt. A cartouche consists of a flat shield-like or oval shape that will have a carved monogram or inscription in its centre. These are just a few of the different wooden carving designs that you can find on lots of different types of wooden furniture. There are many more designs and patterns out there, and if you want to know how to take care of this type of furniture, a quick search online will lead you to articles that can help you. For centuries, carving decorative patterns on wooden antique furniture is something that has been commonly practiced. Antique pieces feature intricate carvings and elaborate detail, you can just imagine the amount of patience and work put into them by an artist from days long gone.